3, 2, 1...We're Back in the Room. It is Sunday again and this week I have a little more to go on about. It would appear that my Bronchitis is having minimal effect on me at the moment (although I still have a cough) and as a result, I am starting to get back to normal with things. I have even begun to get my attention span back so I have been able to focus for a small while...so good news! "It is a publication that harks back to the spirit of the games magazines I used to buy and has a 'by gamers, for gamers' feel to it, along with an independent content that has been lacking in print since the demise of Harbinger magazine". GO TO THE SITE AND ORDER THE MAGAZINE...NOW! On to other things...the final straw. 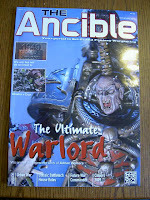 I have been buying Games Workshop (GW) products for years and especially White Dwarf magazine. Literally thousands of pounds have been spent on GW products. 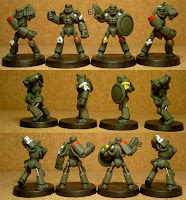 I have been buying their products for over 25 years (ever since the first Space Marine was released)...but no more. Recently GW have been drawing a line in the sand. Children are the target audience now and all those who have supported the company for many years are no longer welcome. GW has become a business now, rather than a company run by gaming enthusiasts and that has meant that some of their recent behaviour has not sat too well with the gaming community as a whole. I will leave you to go and find out about all of the cease and desist notices that have been flying around lately and all of the negative comments that have been generated by them...there are a lot of them out there, I can tell you. What it all boils down to is this: all of the work the die hard supporters of GW have created over the years is no longer tolerated and will be removed by legal action. This includes sites that have been keeping the enthusiasm (and sales of GW products) alive for the games that GW have long stopped supporting...even back as far as the old Rogue Trooper and Judge Dredd games! That really is a smack in the chops for me and all those poor souls who have now been forced to remove years of hard work from their web-sites. As a result of the disgust I feel at the moment, I will not be buying another White Dwarf, or any other product from a GW store again. The only concession I will make is paint (due to the fact that I always have an army on the go and need to keep continuity in the colours) and I will only be doing that until I have finished my current projects and can change paints to a different brand. This is my choice and I will not encourage or disuade anyone from taking the same one...that is up to your own conscience. Further to this, I will not be posting any more pictures, reviews or links to anything GW for fear of receiving a cease and desist notice of my own...and yes, it has got that stupid! Good luck GW...the backlash is building steam. ...and some wooden dowelling to build tracks and wheels for the little armoured vehicles to travel around on. It will be a while before they are finished but I am fairly pleased with the way they have gone so far. For information (probably again!) the two turreted APCs will be for the command and support sections of an infantry platoon, with the two un-turreted ones being for the two standard infantry squads. I reckon that the Christmas holidays may involve cutting a lot of dowell for wheels and gluing together hundreds of individual track links! As of this last week, I have been married to my lovely wife for 18 years. I can only say that I am exceptionally lucky to have found someone who completely understands how obsessed I am with the hobby (even though she niether enjoys it herself nor understands the point to it) and puts up with everything I throw at her all the time (including my job taking me away from home sometimes and putting me in harms way). Soppy as it sounds, I have a soul mate and I appreciate her more and more every day. See you through the rainbow! Another Sunday and yet another lack of anything of any substance to post. I am still suffering from Bronchitis and my attention span is still so short that I can hardly concentrate long enough to tie my shoes, let alone do much towards my hobby. 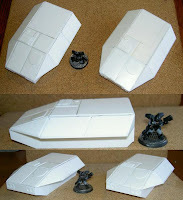 All I have done this week is half-build two tank turrets. I have also managed to base coat the armoured part of four Grymn troops. I shouldn't be posting today because I should be at work...but thanks to Bronchitis, I have been told to go home for the week so it would appear that I have an opportunity to make use of. I doubt very much if I'll be doing any hobby stuff because my focus is completely shot and as soon as I try to concentrate on anything...I wander off...so not a lot will be going on. I did, however, notice that Inso's World has gained another follower so I am pleased to welcome CLAM to my humble Blog. Welcome CLAM, I hope you enjoy your stay and maybe find something to inspire you to works of genius! See you across the wobbly fields! 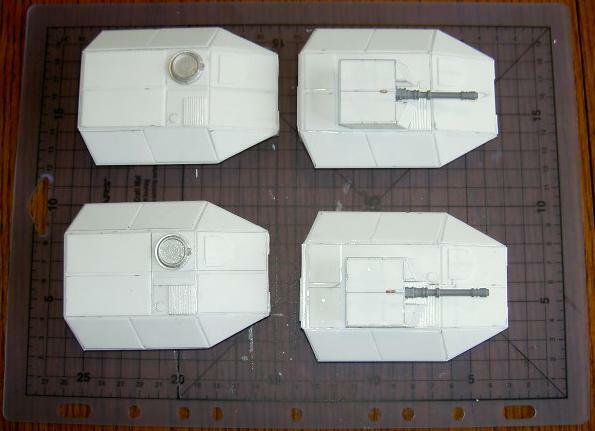 I want four identical hulls, two will be APCs that will carry 8 Grymn and a driver, the other two will have a small turret and carry 4 Grymn a driver and gunner. They will be a Platoon's worht of armoured vehicles, the APCs for the troops and the IFVs for the command and support sections. 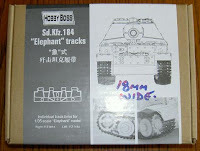 I have purchased a set of tracks for the tanks (with more on the way) so I should have enough to finish 3, if not all of them. So, there you have it. Cut, glue, cut, glue...helps keep Inso grounded :). Well, it's only a short one today but I can be forgiven, can't I? Before things really got started, they quickly faded away. I'm sorry to say that our baby news has turned from joy to sadness...my wife has had a miscarriage and unfortunately the baby is no more. There isn't really much more I can say. If there aren't as many updates as normal, please be patient. See you through the mist. It's Sunday evening again and it is time for a bit of an update. I have had a torrid week with one thing and another and as a result, I haven't had a chance to sort out the stamp for the 15mm guns that I was planning. It is a shame but that is life. I'm sure I will get around to it very soon. I have been cruising the forums again and have seen one or two things that have caught my eye. 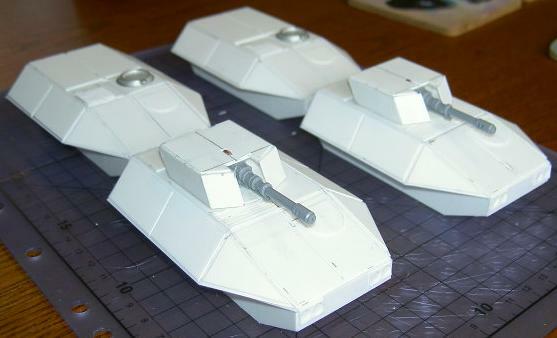 First of all, I was over at the WIP forum and saw an awesome array of scratch-built tanks that have fired my enthusiasm. 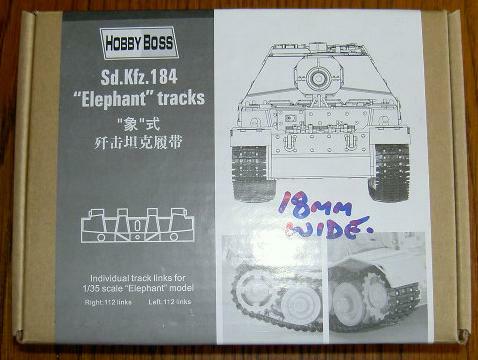 As a result, I have ordered a set of track-links from E-Bay and when they arrive, I will be building a few tanks of my own. Why? Who knows? But it is an itch I will have to scratch before I get on with other things (whether it works or not). I now have a support section (four troops) and a command section (four troops) to go and that will be the assault platoon finished. That also means that I won't have to paint the camo scheme again (as I can treat these as an attached unit) so I should feel more inclined to paint more Grymn (which is always a good thing). Currently, the support section has been based and the command section still needs to be. 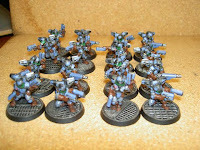 They are all little more than undercoated at the moment but that will change soon. On to other things and I have a second To'ok on the painting table at the moment and he is looking extremely yellow. I just have to add the details and he is done. The Belog is getting painted bit by bit too. I have edged his armour now...but I have done litle more than add basecoats for the colours so far. I wanted to write a separate post for Remembrance Sunday. Ignore all the politics. Ignore all the protests. Today we remember those who have fallen in combat. They fell carrying out their duty, for their country. From WWI to the present day, many of our military personnel and those who support them, have selflessly given their all, whilst carrying out their duty. Here's a To'ok from Spartan Games! I had a great Halloween yesterday. Me and my family went out for dinner and a trip to the cinema; avoiding all of the trick-or-treaters. What better way to avoid the whole thing?! We all went to see 'UP' by Disney/Pixar and we thoroughly enjoyed it. It is definitely a film for all the family and is well worth going to see. 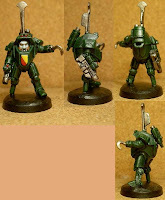 They are Syntha troops and I thought I'd keep them fairly simple. These were the only four I got in amongst the box of Void miniatures I received from E-Bay so there are unlikely to be any more...not with so many others to paint. To change the subject...never underestimate the awesome power of soaking in a nice warm bubble bath. There I was, slowly being boiled alive when I came up with a method of clearing the block on my 15mm Dwarf sculpts. One of the reasons I have sort of stopped on the 15mm Dwarfs is that I couldn't work out how I was going to make the weapons all the same. Well, I've come up with a cunning plan! What I am going to do is make a gun 'stamp' out of plasticard and bits of sprue. With the stamp in hand, I will roll out some Green Stuff and push the stamp into it, making little moulds for the guns. All I'll need to do then is to press a bit of Green Stuff into them and let it dry...a bit of trimming later and I have a gun. Now I realise that the gun will only be textured on one side but most of the Dwarfs have the weapon up against their bodies anyway...so you won't see the other side. I plan on working on the gun-stamp over this coming week...so we'll see how things go. You see?...I haven't forgotten the 15mm Dwarfs, I just met a stumbling block for a short while. There are times when the painting bug strikes and times when the sculpting bug strikes. You just have to ride the ebb and flow and progress when the mood takes you. See you through the condensation!